The Hope Ball Committee has recruited a team of volunteers to help raise funds for the various cancer related programs coordinated by the Cancer Society Grand Bahama Branch at the Venetian Masquerade 2nd Annual Hope Gala Ball being held under the distinguished patronage of their Excellencies Sir Arthur Foulkes, Governor General of the Commonwealth of the Bahamas and Lady Foulkes. Nassau, Bahamas - The range of colours of the topaz gemstone is limitless and diverse, from clear white to mystic blue. If there were an explosion of the many shades of topaz, you would see the rainbow: white, yellow, orange, blue, pink, brown, green and many more shades of topaz. Explosions don’t just happen. There is always a reason for an explosion, be it natural or other. 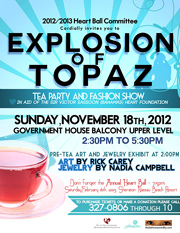 On November 18, 2012, there will be an explosion of topaz for a most worthy cause. Freeport, Bahamas - ZNS annual Fun Run/Walk and Mini Health Fair is scheduled for Saturday, March 31, 2012 at 6:00 a.m. We invite you to come out at 5:30 a.m. for warm-up exercise, pep talk and prayer before the race. Immediately following the race, a mini health fair will be held in the foyer of the Government Complex. Please partake of the free health screenings, literature, health talks, free samples and aerobics by Mrs. Alice Williams of Mind, Body and Soul Fitness Centre. Nassau, Bahamas - The Nassau Music Society continues its 2011-2012 Season with two evenings of classical guitar featuring Marco Tamayo and Anabel Montesinos, well-known, young musicians in the world of classical guitar. Concert dates are Friday, January 27th, 2012 at 8:00pm at the Bahamas Historical Society, Shirley St. & Elizabeth Avenue; and Sunday, January 29th at 5:30pm at St. Paul's Church Hall, Lyford Cay. 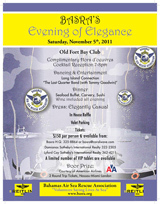 Nassau, Bahamas - The 40th Annual Red Cross Ball will take place on Saturday, January 28th 2012 in the Crystal Ballroom at the Nassau Wyndham & Crystal Palace Casino at 7pm. Nassau, Bahamas - The Nassau Music Society will hold its Annual Members' evening to thank members and friends for supporting them over the years. 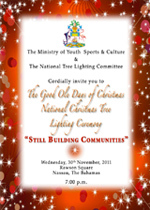 Nassau, Bahamas - The Ministry of Youth, Sports and Culture is hosting the national Annual Christmas Tree Lighting ceremonies around the Commonwealth. This year's theme is " Still Building Communities". 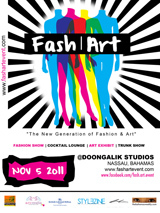 Nassau, The Bahamas-- On Saturday, 5th November, 2011, fashion enthusiast and art lovers can anticipate the official launch of the “black-carpet event”, Fash|Art, hosted at Doongalik Studios, Village Road, beginning at 6:30pm. “All Movies All Day,” “All Access” and “Function Tickets” are now available for the Fort Lauderdale International Film Festival on location at Grand Bahama Island. In addition, organizers have released the full schedule of films and special events to take place during the occasion, which will run from Thursday, October 27 to Sunday, October 30. In addition to two workshops: Underwater Cinematography and Filmmaking in the Caribbean, more than 25 films will be shown over three days during the inaugural FLIFF On Location at the state of the art Canal House at Pelican Bay Resort. Two films will be shown free of charge to the public in an outdoor setting at Taino Beach and Count Basie Square. 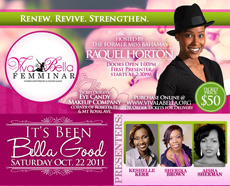 Nassau, Bahamas – Viva La Bella Femminar is getting ready to host their debut event October 20-22, 2011 at the Sheraton Nassau Beach Resort. This event is about building up the whole woman, not just the entrepreneur. It’s about acknowledging some of our flaws as a gender, and recognizing that our beauty is not skin deep as we’ve been told. Viva La Bella Femminar is about believing that our beauty is to the core. Nassau, Bahamas - Theodore Elyett’s Miss Teen Bahamas Beauty Pageant, announces its Swimsuit Best Body Competition! After weeks of intense training and grooming sessions, the contestants of Theodore Elyett's Miss. 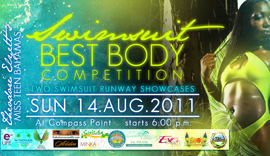 Teen Bahamas Organization® will grace the walk in two different swimsuits on Sunday, August 14th, 2011 at 6:00pm in Compass Point. 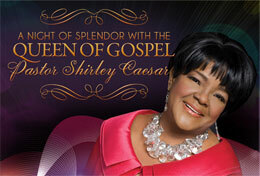 Freeport, Grand Bahama - Don't Miss A Night of Splendor with the Queen of Gospel, Pastor Shirley Caesar on August 19th, 2011 at 7pm at Jubilee Cathedral. Dress Code: Semi Formal Attire. Also Appearing: Pastor Simeon Outten & The New Life Band & The Church of God of Prophecy Brass Band. 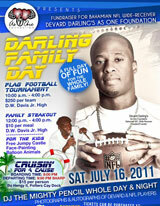 A steak-out, 12noon-4pm, $10 and a party boat cruise, 9pm, $15, Potters Cay Dock in Nassau. 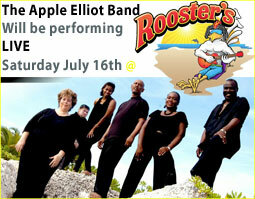 Freeport, Grand Bahama Island - The Apple Elliott Band will be performing at Rooster's this Saturday, July 16th from 8:30pm - 11:30pm. Rooster's is Grand Bahama Island's newest sports bar and club featuring a large concert stage. Located immediately off the traffic circle past Fishing Hole Road. Relax on the couches, sit at the large bar and watch games on the many TV screens or sit intimately at a private table on the open air dance area. 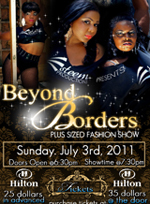 Nassau, Bahamas - Beyond Borders Plus Size Fashion Show will take place this Sunday, July 3rd at the British Colonial Hilton from 7:30pm - 10:30pm . Tickets $25.00 in advance and $35.00 at the door, so get your tickets early. Ultimately our aim is to encourage women to value and appreciate themselves as complete and whole beings; mentally, physically, intellectually and spiritually. They will be fully aligned with our mission, vision and core values in both their personal and professional lives. 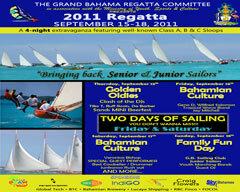 Freeport, Bahamas - The big day has arrived! 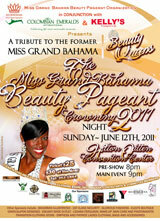 Who will be the next Miss Grand Bahama? Find out by attending the Miss Grand Bahama Beauty Pageant final night, where one of the 9 lovely young contestants will walk away with the crown.